The Brant Club planning session, photo courtesy of Lucia Babina. 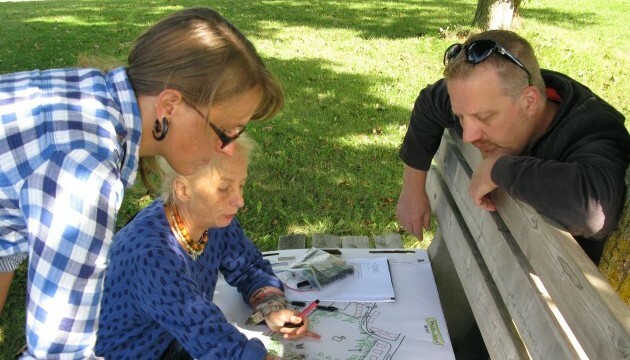 The mural was launched at the beginning of a week of free events in September 2012 including a neighbourhood tree identification walk, an walk to the nearby Guelph Lake Conservation Area, and several community workshops and discussions. This opened a conversation about future spaces for social gathering and created an opportunity to share knowledge about growing and preparing food. On the last day of the week, the artists and members of the community gathered in Dakota Park to imagine possible futures for the park itself and to share food made with ingredients grown in the community garden, with a song performed and co-written by local musician James Gordon and the Summer Camp-a-Mania Kids. Thanks to Brant Avenue Public School, Brant Avenue Neighbourhood Group, Cohabitation Strategies, Everdale Farms, Healthy Landscapes Program (City of Guelph), Nature in the Neighbourhood (Gosling Foundation), Brant Summer Camp-a-Mania Kids, Upper Grand District School Board, Vicki Beard and Guillermo Delgado Castaneda. All their help made this project possible. The City of Guelph followed up with the Neighbourhood Group in late September and set up a public meeting with the community partners to respond to the information gathered through TheBrantClub activities. The City presented some of their ideas for repairs and installations in Dakota Park, and the community got a chance to respond to their proposals. Many of the community members who participated in the week of discussions and workshops were at the meeting, and got a chance to bring some of their ideas to the City. Several community members said that the meeting went a long way to building relationships between the City and the community. The City got to explain some of their funding issues (one city bench costs upwards of $3000) and the community got to provide feedback about better avenues of communication (flyering and word-of-mouth to both low income housing and private residences). In 2013, the neighbourhood will be working with the Guelph Police Service to complete a Community Safety Audit. The neighbourhood group is also planning on making a skating rink in the park, and the planning and maintenance departments at the city are planning on installing new playground equipment.